One morning in 1992, my mom and I were whistling in front of a mirror and I asked her why I didn’t look like her when I puckered. 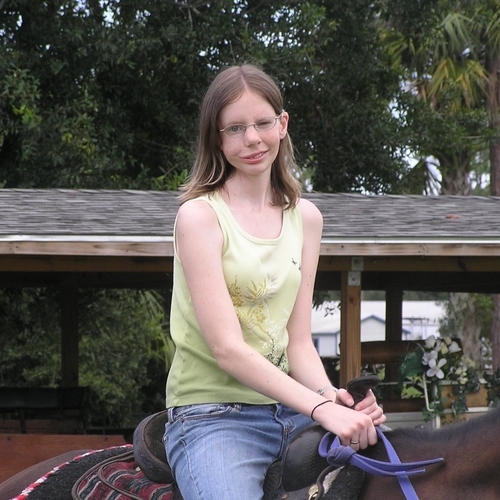 Shortly afterward, I was diagnosed with Rhabdomyosarcoma. I had just celebrated my 6th birthday. By then, I had severe partial facial paralysis caused by the tumor exerting pressure on my nerve. Over the course of the next four years, I had surgery, radiation, and chemotherapy, which included treatment for two relapses. Despite these challenges, I managed to stay in school and have a relatively normal childhood. Kids can be very accepting, and my classmates never made me feel like I was different, even with facial paralysis and a bald head. As I started middle school in sixth grade, I was finally cancer-free. I was thriving in the Gifted and Talented Center, playing the piano, and singing in chorus. Wednesday, June 3rd was my 12th birthday. On Friday, six years after my first diagnosis, my mom took me to my oncologist because she noticed a mass in my neck and chest. I had a biopsy on Saturday, when my birthday party had been scheduled, and a few days later I was diagnosed with lymphoma. The chemotherapy that had saved my life before had caused a different type of cancer. Two more years of chemo followed. I have now been cancer-free for eighteen years. I live on my own in Northern Virginia with my two rescue dogs who keep me busy and entertained. I graduated from the University of Virginia and now work as a compensation analyst for a large government contractor where I am always learning and am never bored. In my free time, I spend time with friends and volunteer at an animal rescue group. I am grateful for what I have and what I have accomplished, but it has not been easy. I have had many late effects from treatment including growth hormone deficiency, difficulty swallowing, and speech issues. I’m deaf in my right ear and wear a hearing aid in my left ear, and it can be very it difficult to follow a conversation with multiple people or when there is any background noise. I was also diagnosed with hypersomnia, or excessive sleepiness, while I was in college. I was struggling to stay awake during class and complete assignments because I was always so sleepy, even with 14 hours of sleep. It took a while to convince my family and doctors that something was not right and it wasn’t just that I liked to sleep, and once I was diagnosed, I started taking medication which helps tremendously. Despite all of my challenges, I think my experiences have made me a better person, and in a way, I am grateful for everything I have been through. Cancer has shaped me into the person I am today, and I cannot imagine who I might have been otherwise.